The die is cast in Barcelona. 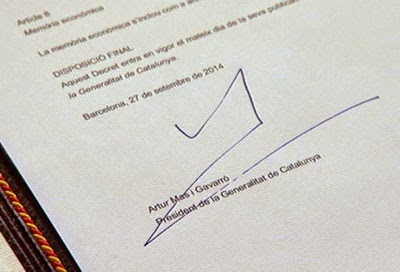 Catalan President Artur Mas has just signed the decree calling an independence vote on 9 November. The Spanish government will hold an emergency cabinet meeting on Monday, once Prime Minister Mariano Rajoy is back from his state visit to China, to officially announce that it will lodge a legal challenge at the Spanish Constitutional Court. The immediate effect of the move will be that the decree signed by Mas today will be suspended until the Constitutional Court issues its ruling. However, Catalonia’s pro-independence parties are expected to keep campaigning while waiting for the verdict. It is important to bear in mind that, based on a separate Catalan law that came into effect this morning, the legal status of the 9 November vote is ‘non-referendum consultation’ (consulta no referendaria). This means the vote would not be binding. The Catalan government believes this should provide a sufficient safeguard against legal challenges from Madrid, but is clearly also taking a gamble: even if non-binding, the outcome of an independence vote would be politically very difficult to ignore. A legal battle is most certainly ahead, and we will keep monitoring the situation very closely. If you want more background on Catalonia, you can read our previous blog posts (see here and here).